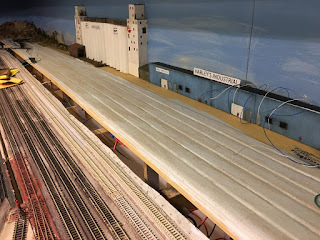 Here is a quick update on the new city terminal, container depot and storage tracks I am building as well as experiences building the lift up bridge. 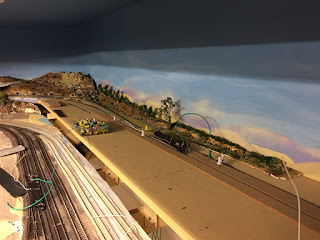 When finished the layout will be one mainline which is mainly double track except for a section through the mountains and across Feather River. There will then be a major branch line from Gleeville to Beauville, with another branch to "Tree No More" the pulp mill. This branch line will extend to HJ yard and reverse back through another storage yard yet to be named. 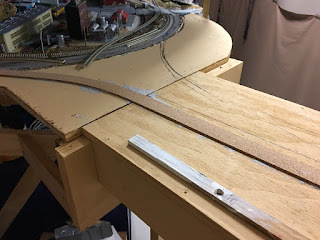 On the new sections I used 12mm plywood as the roadbed and glued 3mm plywood sheet on top of that. The reason for the dual plywood was there are two areas where tracks pass under this new section and I wanted to get extra clearance. So in those areas (where the tracks are underneath) I split the 12mm plywood and just had the 3mm plywood covering those tracks. 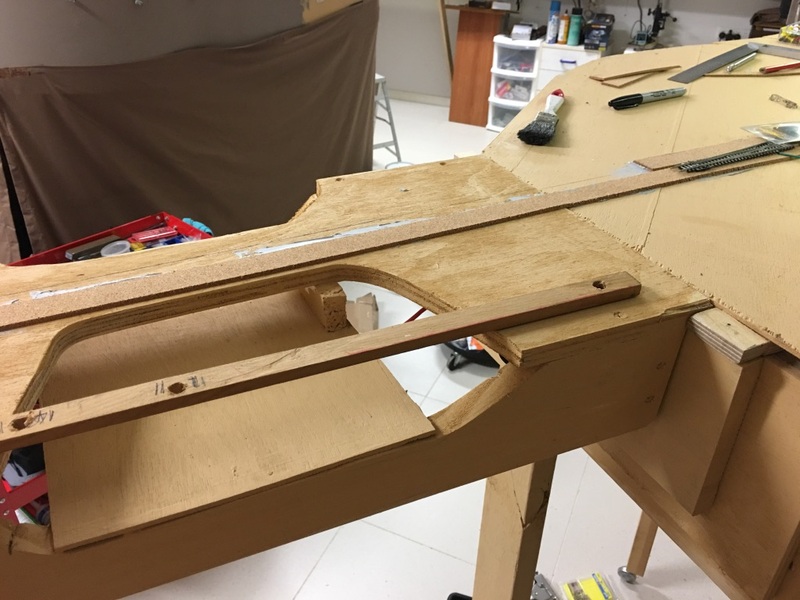 With the base and small overlap of the 3mm plywood there is sufficient strength and no sagging. 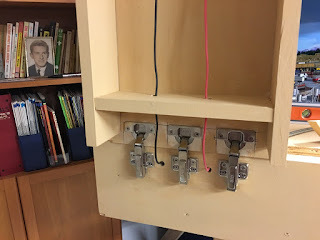 Once all the plywood was glued down and screwed to the risers below I sealed the base with cheap latex paint. Then we were ready to lay out the track and switches and draw lines ready to lay the cork roadbed. For the cork roadbed I bought 3mm sheets from Hobbyco in Sydney and proceeded to cut them into 20mm wide strips with bevelled edges. This was easy to do by using a metal straight edge clamped to the cork sheet and running the Exacto knife at an angle. I used caulk to glue the cork down and a roller to press the cork into the caulk. In some cases I held it in place with pins, especially on the bends. After a day I sanded the edges of the cork to improve the bevel, and then using a long sanding block sanded the top of the cork. 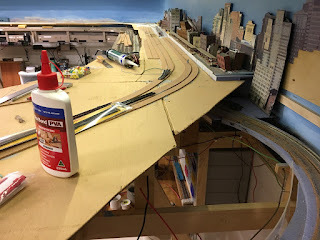 After this I painted the cork roadbed to help seal it. It is best to do this as later when ballasting the water and diluted glue used to hold the ballast can seep into the cork and lift it. I test fitted some of the old city to see if it could be re-used. The park will fit well and the Leeville Central Station will probably work beyond that. The next phase was to finish the lift up bridge and run the cork roadbed across it. Follow the following photos to see the construction and how I stabilised the bridge to ensure the tracks will always align. Here you can see the bridge is aligned with a plywood stop and small plywood blocks on each side. All of this was glued with waterproof PVA glue and screwed in place. From this picture below you can see the base for a rail bridge and river or creek. Lift up bridge in place. 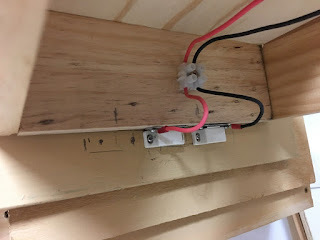 I then installed two magnetic catches on the base of the bridge and wired them as shown. The red and black wires shown here go to the metal plates. Behind the magnet sections on the baseboard are soldered red and black leads to go to the bus wires and track beyond the bridge. When all this is connected power will not flow to the tracks on the bridge or the open side if the bridge is raised. Hence this should protect trains from falling onto the floor. Here is the hinged end of the bridge with the bus wires installed. A 2nd set is currently not planned as trains will be stopped by the bridge if an operator is inattentive. Not ideal but I am guessing this would be a rare occasion, if ever. Bus wire through bridge to rest of layout. Here is the first cork roadbed laid over the bridge. Note it is glued across the gap. It will be cut at the joint with a fine blade mitre saw so the bridge can be raised. I have cut the cork and tested the bridge and alignment and so far happy. 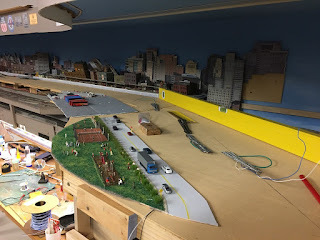 More news when we lay track and get the first train running.